To be a princess--spoiled and adored! Few real princesses have enjoyed such a life. The real princesses have been lost in our love of fairytales. Princess Palace explores their lives and loves, adventures and tragedies. Let’s celebrate and commiserate with these most (un? )fortunate of women. The third child and second daughter of Queen Victoria and Prince Albert, Princess Alice was a dutiful but strong-minded individual. Six months after nursing her dying father, she married the future Grand Duke Louis IV of Hesse, a match that her father had approved. However, her wedding was very small and intimate due to Albert's recent death. In Hesse, Alice made a habit of looking after the poor and the sick, even learning some nursing skills. She was also a hands-on mother (see The Kiss of Death). She shocked her mother by breastfeeding her own children, for which reason Victoria famously named on her cows Alice! Four of Princess Alice's seven children died tragically. Her daughters Elizabeth and Alix were both murdered by the Bolsheviks in the Russian Revolution as Grand Duchess Sergei and Empress Alexandra. Her second son, Friedrich, a hemophiliac, died at age two after a fall from a window. Her youngest daughter Marie died at age four from diphtheria. Alice followed her a few weeks later, on the 17th anniversary of Prince Albert's death, having contracting diphtheria herself while nursing her little ones. Her oldest daughter Victoria became the mother of Earl Mountbatten of Burma and the grandmother of Prince Philip The Duke of Edinburgh. 3: Victoria went into confinement for the final time on the 13th April, for the birth of her youngest child Beatrice. Beatrice was born a day later on the 14th April. She started to write in her journal again on the 29th, which is when this birthday mention was written. “At this point Alice stepped in as principal family caregiver. At eighteen, the princess’s maturity would astound witnesses to the unfolding tragedy. She dropped every other pursuit of interest, including writing anything frivolous to Louis, informing her fiancé only of the facts surrounding the prince consort’s illness and of her mother’s needs: ‘I only hope that I am really useful to them... and I would still gladly bear everything, if it were possible.’ One observer, Lady Lyttelton, called Alice ‘the angel in the house’ [which makes it more ironic when Victoria, a few years later, said that Alice was the true ‘devil’ in the family]. 9: On 5th April 1863 Alice gave birth to her first child, she was named Victoria. Victoria (who would later be the grandmother of the current Duke of Edinburgh, the current Queen of England’s husband), was born in England with Queen Victoria present. 9: On 1st November 1864 Alice gave birth to her daughter Elisabeth, later Grand Duchess Elisabeth Feodorovna, who was nicknamed ‘Ella’. 12: On 25th November 1868 Alice gave birth to her son Ernest, nicknamed ‘Ernie’. 13: “She daily went to the hospitals and ambulances, directing and organising the best means of relief, and bringing comfort and brightness wherever she went, proud to work like the wife of a German officer whose only thought during her husband’s absence was to relieve as much as possible the misery and suffering of the wounded soldiers. ‘The Alice Society for Aid to the Sick and Wounded’ did grand work all this time. The Princess established a ‘depot’ at her own palace of all hospital necessaries, and organised committees of ladies who served out refreshments day and night at the railway station to the wounded who were constantly passing through Darmstadt on their way home. 15: Victoria had been becoming increasingly annoyed with Alice over the years. At this point, Alice and Louis’ financial situation was getting rather bad. “Helping to pay the price for opposing Prussia in the war also imposed its own financial demands, which used up the last of Princess Alice’s dowry.” (’Ella: Princess, Saint and Martyr’). Victoria wrote to her daughter Louise on the 2nd November 1871 “Alice and Louis left yesterday. I warn you that (besides begging for much money again which must never let her think you know or tell anyone else) [she] is moving heaven and earth to stay, taking the children’s coughs as a pretext, the whole winter in England living at my expense”. She also wrote on the 11th “Beware of incurring debt (as Alice has to a very serious extent)”. 18: On 24th May 1874 Alice gave birth to her last child Marie, nicknamed ‘May’ and sometimes ‘Maysie’. A few days later she said “Fancy having two up there in that blue sky, two of my little angels. I wonder if they know that ‘mother dear’ is looking at them, and if my two sweet little loves are looking down at me! Only no more, not Ernie. I could not bear that; it would kill me to have to give him up too.”. 22: “With the horrendous shock of Alice’s death, Queen Victoria was jolted into a reappraisal of what this daughter had meant to her. In a torrent of grief, she wrote Vicky of her agony: ‘My precious child who stood by me and upheld me seventeen years ago on the same day taken, and by such an awful fearful disease... She had darling Papa’s nature, and much of his self-sacrificing character and fearless and entire devotion to duty!’ The bitterness and animosity she had shown Alice, the anger at this daughter’s progressive views and her willingness to thwart her mother’s wishes, would appear to have fallen away. It would be a stretch, however, to surmise that Victoria regretted any of the settled partialities that had led to her alienation from Alice. 24: On 15th June 1884 Alice’s daughter, Ella, married Grand Duke Sergei Alexandrovich. 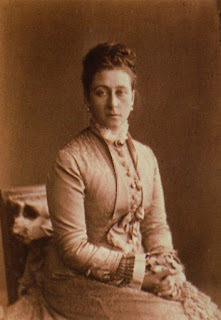 26: On 24th May 1888 Alice’s daughter, Irene, married Prince Henry of Prussia. 28: On 20 March 1889 Alice’s daughter, Irene, gave birth to her first child Waldemar. 29: On 6 November 1892 Alice’s eldest child, Victoria, gave birth to her son George. 31: On 26th November 1894 Alice’s daughter, Alicky, married Nicholas II. 33: On 15 November 1895 Alice’s daughter, Alicky, gave birth to her eldest child Olga. 34: On 27 November 1896 Alice’s daughter, Irene, gave birth to her son Sigismund. 35: On 10 June 1897 Alice’s daughter, Alicky, gave birth to her daughter Tatiana. 36: On 26 June 1899 Alice’s daughter, Alicky, gave birth to her daughter Maria. How do titles transfer? For example George VI was previously Duke of York and then Andrew became Duke of York, does this mean when William and Kate have children the titles will shift? I know Andrew was born after the King had passed but do titles correspond with how close a person is to the thrown? Come volunteer for the Princess Festival!! Cheryl has a wide range of interests from science to history to the arts, but her overriding preoccupation is with royalty. She has been studying the history of royal Europe since 1981. She frequently lectures on royal topics, seeking always to convey history as vibrant and meaningful. As she says, "These people's lives were not boring when they were living them!" For each posting, I consult a number of sources, including various reliable materials online, scholarly and popular books, magazines, etc. For the works consulted for any particular posting, please contact me at cherylandersonbrown@gmail.com. All rights reserved. All materials in this site are protected by United States copyright law and may not be reproduced, distributed, transmitted, displayed or published without the prior approval of Cheryl Anderson Ciucevich. However, you may provide a link to the blog or its postings.